• This training plan is one of the 200+ Plans included with an Athlete’s Subscription. 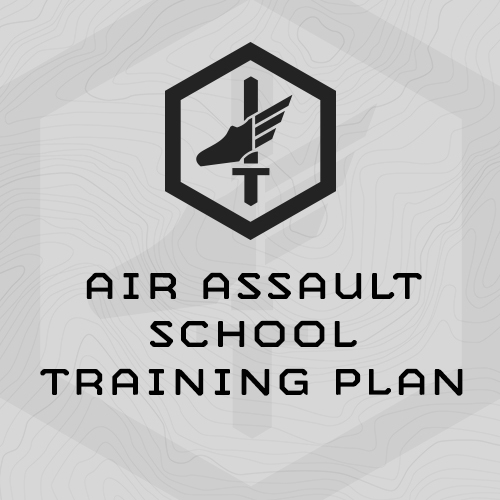 Six-week program designed specifically to help candidates prepare for the United States Army Air Assault School. The Air Assault School is a 12-day course that teaches the fundamentals of air assault operations to include, the Assault Phase which covers aircraft safety and air operations, Sling Load Phase which covers sling load operations, and the Rappel Phase which covers the basics of rappelling from both a tower and aircraft. This plan is a culmination of all available open-source information and based on mini-event training experiences from our staff during their active duty careers. It is designed with an emphasis placed on improving your endurance, hiking ability, and upper body strength. This program follows a general format and gets progressively more difficult each week. Training is designed in a Monday – Saturday format, 5 days on, 2 days off. The program is designed to be completed exactly 6-weeks prior to attending Army Airborne School. The program begins at an easy level, but progresses rather quickly in relative intensity throughout the training cycle. Note: The Air Assault School contains a number of non-fitness components such has air and sling load operations. This plan does not prepare you for these non-fitness events. However, by building your fitness you should be better prepared mentally to address these non-fitness demands when they arise during the course. 35% of Max Push-ups from APFT+ No. 1 Score. 35% of Max Sit-ups from APFT+ No. 1 Score. 35% of Max Pull-ups from APFT+ No. 1 Score. Gym numbers mean nothing. All that matters is mission performance. To this end, MTI's fitness solutions and programming are not boxed in by convention, tradition, orthodoxy, public opinion or any other artificial constraint driven by inside or outside forces. We begin with the raw fitness demands of the mission and build a fitness solution which directly prepares the athlete for those demands. MTI's programming is not "re-tread" bodybuilding, football, CrossFit, kettlebell, strength or general fitness programming. We've built our fitness programming for mountain and tactical athletes from the ground up. The Fluid Periodization methodology we deploy to concurrently train multiple fitness attributes is completely original and has continued to evolve and improve over the years. Our mid-section training methodology, Chassis Integrity, is also original, as is our endurance programming, 7 strength training progressions, tactical agility, and work capacity programming. Our mountain sports pre-season training plans, tactical PFT, selection, school, course, and fitness improvement training plans across military, LE and Fire Rescue are MTI-developed, tested and athlete-proven. Over the years hundreds of athletes and coaches have taken our advanced programming and unit fitness leader programming courses and MTI is widely recognized within the mountain and tactical professions and fitness media as a thought leader in fitness programming for military and tactical athletes. → Research: MTI begins program design with extensive research of the fitness demands of the mission, sport or event, identifies the exercises and progressions which sport-specifically meet those demands, chose end-of-cycle goals, and program backward to design the training plan. → Deploy & Assess: We deploy the training plan "Lab Rats" at our Wyoming facility. Training session and cycle issues are identified and fixed as we work through the training plan. Post cycle we assess the programming's effectiveness and efficiency. We keep the stuff that works, and fix or toss the stuff that doesn't. → Publish & Assess Again: Plan is published for purchase as an individual training plan and made available to our subscribers. Feedback/results are assessed. → Iterate: We take what we learn from lab rats and athletes, re-visit, update and improve already published training plans. Several of our individual training plans are on their 4th or 5th version. MTI exists to "Improve Mountain and Tactical Athletes mission performance and keep them safe." To that end, we have developed a unique research methodology aimed at identifying real world areas of improvement and identifying immediately deployable mission-direct solutions. Click HERE to learn more about MTI's Mission-Direct Research methodology, and Here to read about just few of our research efforts. Our stuff works. Weekly we receive unsolicited reviews of our programming and testimonials to its effectiveness. MTI's library of 200+ sport-specific fitness plans for mountain and tactical athletes is unmatched. Resources range from specific programming for tactical special forces selections, to specific plans for climbing Rainier and Denali, to general fitness solutions such as running improvement, to post-rehab from injury. Over the past decade, MTI has partnered with hundreds of athletes throughout their individual mountain and tactical careers, and provided fitness solutions as they face new mountain objectives, tactical schools, selections, PFTs and deployments, and came back from injury. Our work is not limited to US Athletes. We've developed selection-specific training plans for Canadian, UK, Australian and German Special Forces Selections and worked with individual military personnel from Scandinavia, South, and Central America. Canadian, Australian, UK and western European law enforcement and fire/rescue athletes have used MTI programming for mission-direct fitness. On the mountain side, Alpinists from Japan to Slovakia have consulted with MTI and used MTI's programming to prepare for mountain objectives. MTI’s exists is to improve Mission Performance for mountain and tactical athletes and keep them safe. This focus on “mission direct” solutions, enhancements and improvements drives our work and research and extends beyond fitness solutions to include training, leadership, gear, team culture, and safety. Fitness is just one area of our work. Our non-fitness research has included tactical cultures, combat uniforms, and gore-tex performance, and effect of stress on marksmanship. Our work on defining what it means to be a Quiet Professional has had penetrating influence and driven healthy conversations with both mountain and tactical professionals. Since 2007 we've taken and answered dozens of questions weekly from mountain and tactical athletes. We've saved these individual Q&A's and now thousands are archived on our site. We're not salesmen, and our answers are noted for their directness, honesty, and clarity. Our stuff isn't for everyone. If we can help, we'll let you know. If we can't, we'll let you know that, too. All of the Above is Backed Up By Our Promise: Our Stuff Works. Guaranteed. I received notes frequently from athletes hesitant to purchase a subscription or training plans asking me to sell them on why they should make the purchase. While I understand the question, I’m not a salesman - so I can't put a hard sale on anyone for our programming. I can tell them the process we go through to design our programming. We begin with extensive research on the fitness demands of the event, identify the exercises and progressions which sport specifically meet those demands, chose end-of-cycle goals, and program backward to design the plan. Then we test the cycle on ourselves and our lab rats here in Wyoming. We document, note what works and doesn’t work, re-assess, and make changes and modifications. Then we publish the programming in the form of one of our plans or as part of our subscription daily training sessions for tactical and mountain athletes. We don’t stop there - our daily programming is the “tip of the spear” for our programming evolution. We use these sessions to learn and make continuous improvement. As we learn more and improve, we go back, and update the sport-specific training plans on the website. For example, we’re currently on Version 5 of our Ruck Based Selection Training Plan and Version 3 of our Dryland Ski Training Plan and Version 4 of our Big Game Back Country Hunting Training Plan. We understand our programing isn’t cheap, but we believe it’s a great value. The $79 for the Ruck Based Selection Training Plan, and $39 for the Dryland Ski Training Plan reflect the, research, work, innovative theory, iteration, testing and feedback we've put in and received to make these plans effective. All that matters for us is outside performance, and we feel strongly that Our Stuff Works in the real world. If you purchase an individual training plan, follow it as prescribed before your season/event/pft/selection, and if you don’t feel you were physically ready for your season/event/pft/selection, and/or didn’t see dramatic improvements in your early season performance, we’ll refund your money, no questions asked. If you purchase an Athletes’ Subscription, follow the training sessions as prescribed, and are not satisfied with the quality of the programming, notify us within 30 days of purchase, and we’ll refund your money, no questions asked. Is it true you guarantee your stuff works? Yes. If you purchase an Athletes’ Subscription, follow the training sessions as prescribed, and are not satisfied with the quality of the programming, notify us within 30 days of purchase, and we’ll refund your money, no questions asked. How is MTI programming different than CrossFit? This is a common question. Read our answer HERE. You have a lot of competitors. Why should I choose MTI? MTI is driven to improve mountain and tactical athletes’ mission performance and keep them safe. This emphasis and focus on mission performance sets us apart. Read about more that sets us apart HERE. If I purchase a plan or subscription, how do I access the programming? All of our plans are online, accessible via username and password. You can log in through our →Website or Mobile App →IOS and Android. Do you have downloadable .pdf’s of the training plans? No. But you can print the programming, by week, from your browser. You access individual training plans online via a username and password. Yes, we do. Available for IOS and Android. What is the difference between purchasing an individual training plan, packet of plans or an Athlete’s Subscription? Plan – Like purchasing the DVD of the first Star Wars movie. You own it forever, including any updates we make to the plan. Packet – Like purchasing the DVD’s of all the Star Wars movies. You own them forever, including any updates we make to the plans. Athlete’s Subscription – Like subscribing to Netflix. You get access to all 200+ plan in our library, but lose access if you unsubscribe. If I purchase an Athletes Subscription Can I cancel on my own, anytime? Do I have to contact MTI to cancel or can I do it myself? You can do it yourself. Instructions HERE. If I purchase a subscription and have questions about where to start or what plans(s) to use for my goals, will you help? Yes. We answer dozens of training questions from athletes weekly. Email coach@mtntactical.com. If you add new plans or update existing plans after I subscribe will I have access to them? Yes. We are continuously adding training plans and packets (2-5/month) and updating plans. With your subscription you’ll have access to all new plans, new courses and plan updates. Click the “Required Equipment” tab to find out what equipment is required for the specific plan you are interested in. Where do I find unfamiliar exercises? See our Exercise Library HERE. The Run and Ruck Calculators are listed as exercises. See our Nutritional Guidelines HERE. Can I see sample training? Click the “Sample Training” tab to see the entire first week of programming. You are encouraged to do it before purchasing. What if I have more questions? This Plan is one of 200+ plans included in the Athlete's Subscription. Don't know where to start? Looking for a specific plan or guidance from a goal? Sign-up for our BETA newsletter. Training tips, research updates, videos and articles - and we'll never sell your info. Copyright © 2019 Mountain Tactical Institute. All rights reserved.